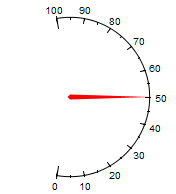 The Angle Gauge object allows you to display data in a manner similar to a speedometer, or a power meter. With adjustable starting/ending angles and values, many configurations are possible. See the general Placement Properties page. To include information stored in a Vantage Point Server, click on the red Links icon, which will open the Point Manager window. Use the Point Manager to select the data source you wish to display in the Angle Gauge object. See the Point Manager page for more information about selecting data. The current value of the retrieved data will be shown in the Current Value text box. Blank - No colors, gradients, or images. Solid Color - Uses a single color for the background. By default, the Indicator is solid red in color and 5 pixels in thickness. To change the color from the Color Picker, click on the colored box next to Indicator Color. Alternatively, you can enter the hexadecimal value in the text box. You can also be adjust the transparency of the color with the slider to the left of the text box. If you have a particular image you would like to use in place of the default Indicator, type the image's location in the Indicator URL or navigate to its location by clicking on the ellipsis box to the right of the Indicator URL text box. The Visible setting tells the presentation whether or not to display the ticks and values on the gauge. Background Color alters the color behind the values while Foreground Color alters the color of the ticks. Major Increments determine the frequency of long ticks and Minor Increments determine the frequency of short ticks. Radius adjusts the diameter of the gauge, altering the object's size if necessary to accommodate the new radius. The Start Angle and End Angle tell gauge where to place on the circle the low value and high value respectively. 0 and 360 are located at the center-right of the the circle. Values less than 0 and greater than 360 are acceptable.